I always like playing the balancing games on the WiiFit balance board, and I look forward to trying out the Shaun White Snowboarding one soon. 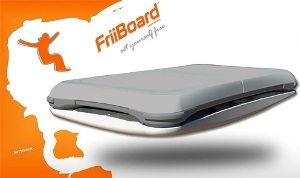 For those who want another version of Shaun White on the Wii Balance Board should try the Friiboard. The slogan is “set yourself free”, and I can see why. The Friiboard is an attachment for the Wii Balance Board that is placed underneath it. I’m not certain how it attaches, but it had better be well in place for what it is supposed to do. After all, Shaun White and other games that use the Wii Balance Board allow you to lean to steer. Now, that is a level of realism that most games do not have, but the FriiBoard allows you to really feel it. Like if you lean one way, you will actually tip. That won’t happen on the Wii Balance Board unless you lean too far and fall over. You can purchase the FriiBoard on the SWiit Game Gear site for about $45. Yes, that is a lot to pay for a piece of plastic. Maybe it would be cheaper to get that Tony Hawk Guide. While you over at SWiit site, you might want to check out the SWiing Stick to improve your Wii Golfing game.